The attorneys and staff with Althauser Rayan Abbarno, LLP are very appreciative of the men and women in law enforcement keeping us safe on a daily basis. Yesterday, on Law Enforcement Appreciation Day, Althauser Rayan Abbarno partner Peter Abbarno delivered snacks to local law enforcement agencies. 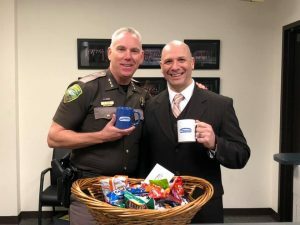 Thank you Sheriff Rob Snaza and the Lewis County Sheriff’s Office, Chief Nielsen and the Centralia, WA Police Department, Chief Schaffer and the Chehalis Police Department, Washington State Patrol, Washington State Fraternal Order of Police, Washington Council of Police and Sheriffs (WACOPS), and all the men and women in our Country and State that work daily to keep us safe! Thank you!